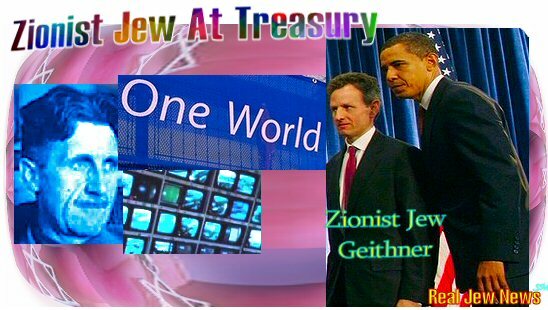 ZIONIST JEW TIMOTHY GEITHNER was confirmed as Secretary of Treasury by Obama on November 22 2008…another banner day for the global Zionist Rothschild elite. Geithner, who was born to a Jewish family in Brooklyn NY, has been serving the Rothschilds as the President of the Federal Reserve Bank of New York since 2003. Many believe the New York Fed to be more powerful than the central Federal Reserve Bank since it is centered in the heart of the Zionist financial command and control matrix. In recent years, Geithner has played a leading role in a myriad of major financial issues including the recent liquidation of Bear Stearns. “The global banks need to operate under a unified framework that provides a stronger form of supervision. An authority over the infrastructure is needed. The Federal Reserve should play a central role in such a framework.” View Entire Story Here. Indeed, Timothy Geithner, is a Zionist careerist with a reputed lust for power that has now elevated him to the front line of the visible elite in Washington. GEITHNER’S CALL FOR A GLOBAL REGULATORY BANKING SYSTEM is part of the financial elite’s agenda for a ‘cashless society’ which would utilize RFIDs and microchips. Geithner’s colleague, (and fellow Rothschild servant), is the Zionist Jew, Jean-Claude Trichet, who is the President of the European Central Bank in Frankfurt Germany. Trichet was also a Bilderberg 2008 attendee. “Today through SEPA we can now make payments across national borders by a simple credit transfer. And this is only the beginning! With the coming SEPA Cards Framework the payment process becomes fully electronic.” View Entire Story Here. The very same goal is in store for America, of course. When cash is outlawed, the thriving underground economy predicated on cash will also vanish with it…and the controllers will have virtually everyone under total financial control. There’ll be no more working for cash under or over the table. On October 14 2008, Bloomberg Financial News announced the implementation of ’stored valued cards’ to be used by retail chains throughout America. Stored-value cards have an imbedded microchip by which the purchaser’s checking account ‘loads money’ into the retailer’s cash register at the point of sale. Soon all credit cards will have microchips. Constraints on who can ‘buy & sell,’ (the agenda of the Anti Christ), is coming soon. And Obama’s Zionist Jew at Treasury, Timothy Geithner, will be leading the way. Internet censorhip is about to be cranked-up. Please pray for the Lord’s protection of our site, Real Jew News. I may have to get legal counsel to prepare for the worst. Do any of you know of lawyers who specialize in Internet censorship? Email me please if you do at bronathanael@yahoo.com. “Change” is one big hype by the Jews’ puppet Obama. The Military/Jew Complex owns the political rock star Barky. We now have 3 Jews in Barky’s adminisration, a IsraHell racist by the name of Rahm Emanuel, a One World Anti-Christ Jew, by the name of Timothy Geithner, and the Globalist Jew, Laurence Summers, on Barky’s economic team. Hillary might as well count as a Jew, since all of her handlers are NY Jews. But, we have a fighting chance of promulgating the Truth through Real Jew News. As the economy worsens and jobs are lost, Americans are going to start seeking for the problems and looking for answers. Real Jew News has been getting a tremendous increase through Google Searches ever since the Bailout Hoax begun 6 weeks ago. Once again Br.Nathaneal has produced a brilliant,well researched piece. I recently sent you $100,if you keep making these stories,I’ll be forced to send more! Truth be told,I’m an atheist,but if this “cashless/chip in hand/buy&sell” issue comes to pass(which is a no-brainer),I will have to seriously reconsider the prognostications uttered in the bible as truth. Also,you may want to contact Edgar Steel of www.conspiracypenpal.com,he’s an attorney who has done pro-bono work for people in similar situations as yours. great article of warning !!!!!!! i never heard of SEPA before now. don’t take the mark of the beast, his name, or his number !!!! or microchip implant, or invisible tatoo, don’t take anything from the devil !!!! Brother Nathanael, thank you for your research and hard work. Apparently, all the signs are there. We seem to be entering into that period we have been warned about in Revelation. When else, in the history of the world, have all of the elements been able to come together? Yet, I still hope in the Lord. IF He determines it is THAT time, He will allow it to proceed — BUT, if it is not yet the time — I know that there will be great signs and wonders which will appear in the sky and on earth — to turn men’s hearts to God. Through Prayer andf Fasting, God may delay his chastisements and judgement — but without Repentance on a worldwide scale, I am afraid that the ‘permissive’ will of God will allow these ever increasing tradgedies to continue. Thank you for that Ezekiel spirit (Ezk 3:17) whereby as the Lord’s watchman you seek to WARN the people. But, how many will truly listen? U.S. 5 Star General Douglas MacArthur confiding to/in/with Catholic Bishop Fulton J. Sheen while visiting Allied Occupied Japan after VJ Day. “…she said that whenever she had any difficulty in getting instructions from Moscow because of the war, she was to go to any one of three WEALTHY CAPITALISTS in the Waldorf Towers. What amazed Doctor Dodd was that whenever these men gave instructions, Moscow always ratified them. When asked who the men were, Doctor Dodd refused to name them. But when pressed to say ultimately who ruled this ‘higher order’, she replied simply, ‘SATAN’. WORLD PEACE OR THE ANNIHILATION OF NATIONS? Don’t forget that the satanist oftimes know scripture inside out, just like the preacher. The intentional fulfillment of “signs” given in the Bible may in fact be cynical and pre-meditated attempts to activate the irrational mind’s ability to make that “prophesy” come true. In that sense, excessive alarmism can be harnessed unintentionally to their agenda to alter the mass psyche of the people of the planet, and particularly Christians, to a passive and malleable state. Be on your guard that the wicked one does not use you as a tool of a perverse and contrived “destiny.” How hard they must laugh as they play out their lie, and we reel it up as if it is a life line to true understanding. LORD JESUS CHRIST we are in YOUR HANDS, HELP US SINNERS! Tell me where the following is in doctrinal error: God made us sentient creatures with free will. If all we do is pray and wait for the end of the world, and do not act when we should, the Devil will win. The Apostles had to proselytize actively to spread the Word. These times are no different. The devil works his evil through LIES. SIXTY MILLION SOVIET CHRISTIANS WERE MURDERED BY THE ZIONISTS (and their helpers) IN RUSSIA. The Revelations of John does warn us that it will be the Beast of the Land that gives the Beast of the Sea its power and causes it to be able to restrict buying and selling to those who hold its mark. The most important question that Christians should be addressing is who is the Beast of the Land? Do we actually follow it? It was only last year that Pope Benedict with George Bush signed in the Noahide laws with the Sanhedrin Jews. Thus, is the cause of this evil more of a concern or the consequence it produces for mankind? St John of Kronstandt (+1910) of Russia warned us of the new age church and to keep out of it. In his vision he was clearly describing what appears to be the Vatican II church and the manner of the mass - the table in the centre of the church and people around it. I am sorry to say that if one is concerned about being micro chipped, then they ought to look no further than their own backyard. Questia provides the world’s largest online library of scholarly books and journal articles, with integrated footnote and bibliography tools, highlighting, note taking and book marking. With a Questia subscription, you’ll have access to the full text of more than 67,000 books and 1.5 million articles. The actual Graces working in and with Brother Nathanael are permitting him to be an Instrument in the Hands of God to get all of this information of his compiling and posting OUT to people the world over via the Internet. But not everyone regularly uses the Internet and perhaps fewer still know of Br. Nathanael’s website’s research and information. Simply print out 3 or 5 copies of Br. 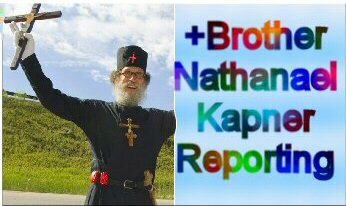 Nathanael’s recent or current posted articles, then simply address 3 to 5 envelopes with the addresses of 3 to 5 random church addresses you can readily find in your local telephone book’s “Yellow Pages”, buy 3 to 5 first class postage stamps, affix them to these addressed evelopes, stuff Br. Nathanael’s articles into the envelopes, seal them and mail them to whatever ‘church’ you want addressing them to and for the ‘Pastor’. Thin sowing means thin reaping. Our lives control by the ZIONISTS? Why isn’t anything talked about turning the table on these zionist controllers? Only the True Church of Christ will save the mankind. And even Evil Spirit can not win the battle. Judgement Day is Coming, who will be saved? The Chosen People of Almighty God. Revelation 7:2-3, Matthew 16:18, Ephesians 5:23, Colossians 1:18 Roma 16:16, John 10:9 Acts 20:28 Lamsa Translation. IGLESIA NI CRISTO (CHURCH OF CHRIST). Eugenics and Zionists? They are just part of the prophesies. Lucifer? Your day is near, in the lake of FIRE. God Bless the true royal blood the heirs of the Holy City. 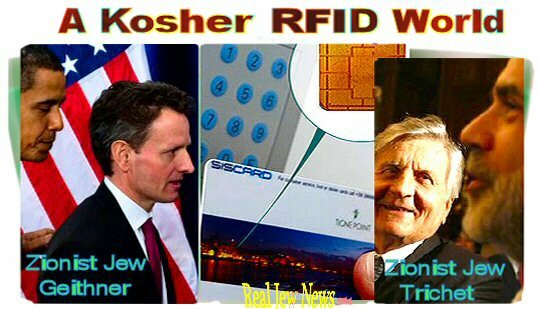 Could you provide some quotes from Geithner or details of his membership of organisations that would indicate he is a Zionist? Or are you just saying he is a Zionist because he’s Jewish? I ran into this potential lie: Tim Geithner = NOT JEW?! I hope someone can clear this up. This stooge is so sunk into the Rothschilds nest, he would still be JEW by wolf-suckling as listed in the uglylist at sheoplenews(dot)com.